E Troop’s second lieutenant was thirty-year-old Sedgwick Rice, a Minnesota native appointed to the Army from that state in 1883. He had served with the regiment since transferring from the 22nd Infantry in the summer of 1886. Rice had only recently joined E Troop at the end of August 1890 at Fort Sill, Indian Territory, after transferring from F Troop and completing instruction at the Infantry and Cavalry School at Fort Leavenworth, Kansas. Lieutenant Rice was injured on the trip from Fort Riley to the Pine Ridge Agency at the end of November. According to the E Troop muster roll, he was, “Sick in quarters from Nov. 27 to Dec. 4, ’90, contusion right knee contracted in line of duty.” Rice’s injury, and the manner in which it occurred, caught the attention of Major S. M. Whitside, commander of the regiment’s first battalion. Whitside in letters to his wife mentioned Rice twice; neither comment was favorable and indicated that Rice was intemperate with alcohol, a vice for which the cavalry major had no tolerance. On 6 December Whitside wrote, “The great Rice is on duty again having recovered from the smash up–still goes about with a black eye and a lame knee.” A week later the major again wrote, “Young wounded knee Rice has sufficiently recovered from the accident he met with on his way up here which was the result of drunkenness as to do a share of his duty. He is without a doubt the most useless appendage in the way of an officer I have met for many a day.” Rice would have the opportunity to prove his worth on 29 and 30 December at the Wounded Knee and Drexel Mission fights. When the fight commenced, our Troop E, was in a position on a hill on the right of the guns supporting the battery; we were mounted and faced the camp. The Indian herd and a great many squaws, who were most of them mounted and some in wagons, went up between us and the wire fence on the road. We immediately dismounted and deployed to fight on foot. Lieut. Sickel, who was in command of the Troop, and myself, gave repeated orders to the Troop not to shoot at these Indians, because they were women and children, but to direct their fire on the herd of ponies. Our orders were obeyed. One of these mounted squaws was armed and fired on our line, and one of the men said then “There is a buck.” And I said “No, it is a squaw, don’t shoot on her,” and he said “Well, by God, Lieut., she is shooting at us.” He did not fire at her. Immediately after that I got an order to take my platoon and go up and clear out the ravine. 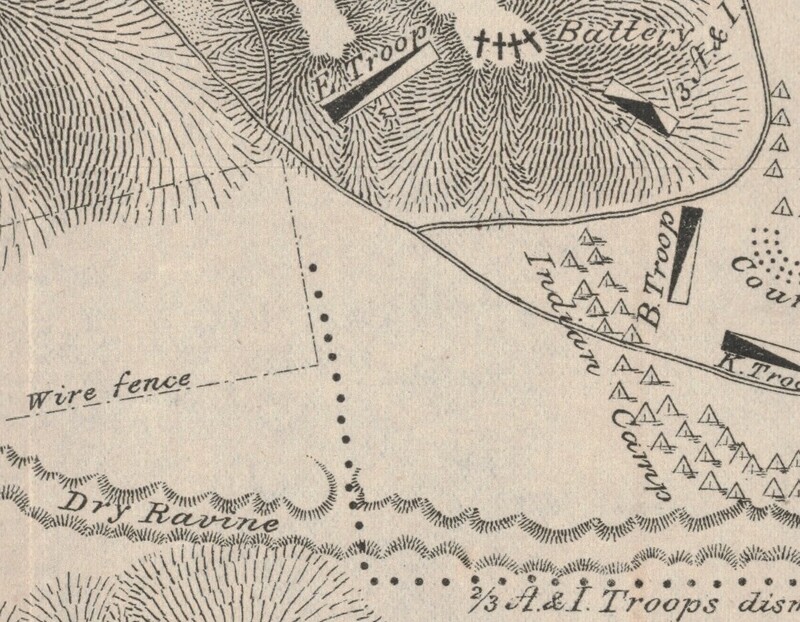 I went up dismounted in a skirmish line to the right, and struck the ravine above the place marked “Pocket” on the map submitted, and worked down the ravine towards camp. On my way up the ravine to the position described, I saw a number of killed and wounded Indians, who were principally bucks. After the fight was over, I was ordered up with E Troop to pick up our dead. I met two Indians scouts and showed them where the killed and wounded Indians were, as far as possible. There was one wounded squaw there, who had cut her own throat and who was in the last throes of death when I went up to her; my men picked up two Indian children, who were alive, unhurt, and I turned them over to the Indian scouts with orders to turn them over to the Indian women captives. Following the campaign, Lieutenant Rice had a hand in recommending five troopers for Medals of Honor–Sergeant A. W. McMillan, Sergeant W. G. Austin, Private M. Feaster, Private T. Sullivan, and Private H. Ziegner–and one for a Certificate of Merit–Sergeant J. F. Tritle. All of these recommendations were ultimately awarded. However, Lieutenant Rice’s own conduct, and that of his troop commander at Wounded Knee and White Clay Creek, First Lieutenant Horatio G. Sickel, initially went unmentioned and unrecognized, if not unnoticed. The following October Captain Charles A. Varnum corrected the oversight in a letter to the regiment’s adjutant in which he highlighted Rice’s actions at White Clay Creek. (Click to enlarge) Captain C. A. Varnum wrote to Colonel Forsyth in October 1891 recognizing Lieutenant Rice’s gallantry at White Clay Creek. Sir: Learning by a recent communication that the conduct of Lieut. Sedgwick Rice, 7th Cavalry in the engagement at Drexel Mission, S.D. Dec. 30th, 1890 had not been called to the attention of the Colonel Commanding, I submit the following which came under my observation at the 2d position occupied by the 1st Battalion in that engagement. Lieut. Rice commanded a detachment of Troop E, 7th Cav’y covering our left flank. When about to withdraw to a new position designated by the Regimental Commander, and after the maneuver had commenced an assault was made on our line rendering it necessary for us to retake the position just left, and drove the Indians off. Lieut. Rice sprang forward at once, leading and encouraging his men under a heavy fire driving the Indians from his front. The engagement was for the time a very hot one, and the action of Lieut. Rice, his gallantry and good conduct was in my opinion worthy the special consideration of the Colonel Commanding. I am sir, Very Respectfully, Chas. 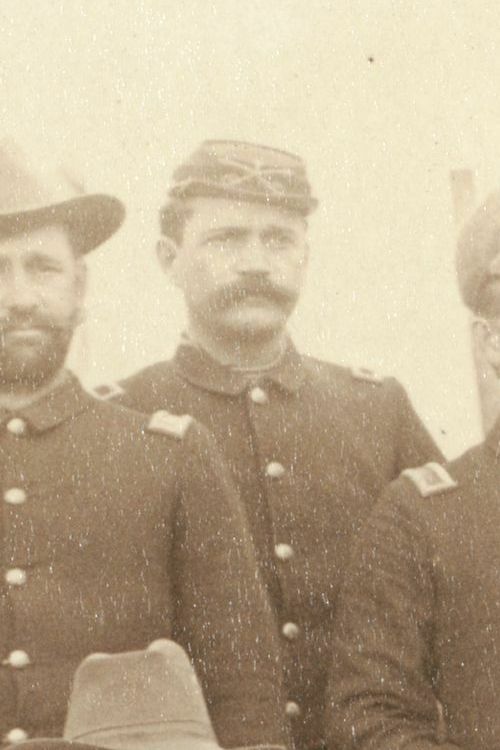 A. Varnum, Capt 7th Cav’y, Com’d’g B Troop. Based on Captain Varnum’s recommendation and another one from Captain Nowlan regarding Lieutenant Sickel’s actions, Colonel James W. Forsyth drafted a letter to the Adjutant General’s Office that both lieutenants receive honorable mention for their conduct. This and other recommendations from the regimental commander were investigated by Colonel Heyl at the direction of Major General Nelson A. Miles. Following are some of the statements regarding Lieutenant Rice’s conduct at Wounded Knee. Lieut. Nicholson testifies: I saw Lieuts. Sickel and Rice, 7th Cavy. move their skirmish lines forward (at Wounded Knee) exposing themselves to a hot fire when only thirty (30) yards from the Indians in the ravine. These are the only cases where I was particularly impressed with the coolness and gallantry of the officers named. Lieut. Brewer testifies: I saw… Rice, 7th Cavy., who were dislodging some Indians. All these officers were conspicuous in exposing themselves. Lieut. Tompkins testifies: While I was down at the ravine, Lieuts. Sickel and Rice came over from the village. I consider the bearing of these officers gallant. Lieut. Rice particularly so. Lieut. Sickel testifies: Directly under my observation at Wounded Knee during the fight, Dec. 29, 1890, were Lieuts. Rice and Tompkins, 7th Cavy. Lieut. Rice, 7th Cavy., remained with the gun when Lieut. Hawthorne was wounded and then took charge of the gun and party. Even Major Whitside, who earlier in the campaign described Rice as “the most useless appendage in the way of an officer” provided laudatory comments regarding the lieutenant’s performance in action. Lieut. Rice while in command of a number of skirmishers, was attempting to dislodge a party of Indians who had taken refuge in a ravine. He walked from one skirmisher to another instructing them how to fire. The Indians were constantly firing at Lieut. Rice and party. Lieut. Rice never attempted to cover himself, but constantly moved to and fro, encouraging his men, exposing himself to the fire, which act in itself I regarded as conspicuous. 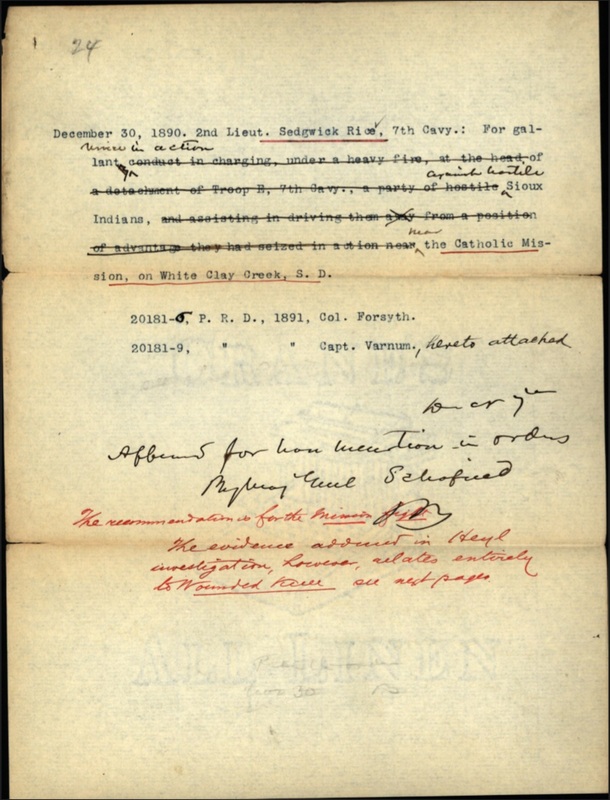 (Click to enlarge) A draft copy of honorable mention for Lieutenant Rice with notes concerning testimony and approval by Major General Schofield. Interestingly, Captain Varnum’s original recommendation pertained to Rice’s conduct at White Clay Creek on 30 December in the Drexel Mission fight, but all of the testimony during Colonel Heyl’s investigation regarded the lieutenant’s actions at Wounded Knee on 29 December. Heyl concluded with, “In the cases of Lieuts. Sickel and Rice, 7th Cavy., the evidence seems to sustain the facts as represented for honorable mention.” The Adjutant General’s Office made note that the recommendation was for White Clay Creek but the testimony reflected actions at Wounded Knee. In the end, Major General John M. Schofield approved a draft version of honorable mention stating gallant service at White Clay Creek. Born at Saint Paul, Minnesota on 25 March 1860, Sedgwick Rice was the seventh child and third son of Edmund Rice, Jr., and Anna Maria Acker. At the time of Sedgwick’s birth, Edmund Rice was the president of the Minnesota & Pacific Railroad Company. 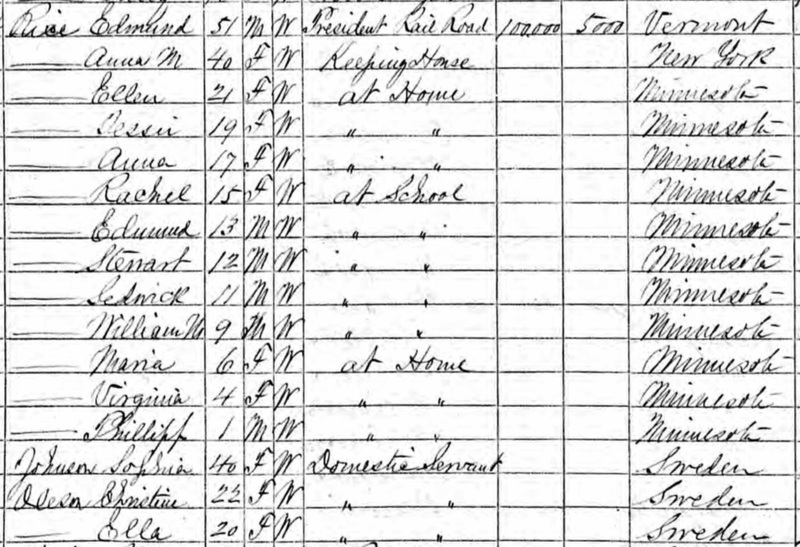 (Click to enlarge) The 1870 U.S. Federal Census depicting the Edmund Rice household with eleven children and three servants. As a railroad executive his estate was valued at $105,000 in 1870. Edmund, a native of Waitsfield, Vermont, moved to Kalamazoo, Michigan, as a young man where he studied law and was admitted to the bar. In his late twenties at the onset of the Mexican War, Edmund volunteered his services and was commissioned a first lieutenant in the First Michigan Infantry. The only regiment from that state arrived at Vera Cruz in January 1848 months after the last of the fighting had ended and just weeks before a peace treaty was signed. Edmund returned to Kalamazoo where he married Anna Maria, the eighteen-year-old daughter of Henry and Ann Marie (Trimmer) Acker. The young couple immediately moved to Saint Paul where Edmund began a law practice before turning his attentions to the burgeoning railroad industry. He was a wealthy and established member of the community by the time Sedgwick was born more than a decade later eventually going on to serve as the mayor of Saint Paul and ultimately as a democratic U.S. Congressman from Minnesota during President Cleveland’s first administration. The Rices had eleven children spanning two decades, five girls and six boys, all of whom survived to adulthood. Edmund Rice was serving his first term as mayor of Saint Paul when Sedgwick Rice entered manhood and showed a desire for an army commission. The young Rice was employed as a clerk at the Merchants National Bank in his native city when he received a direct appointment from President Arthur in July 1883. That October he traveled east to Fort Monroe, Virginia, and passed the entrance examination accepting his commission as a second lieutenant in the 22nd Infantry. His assignments with that regiment took him to Fort Lyon, Colorado Territory, and Fort Reno in the Indian Territory. Three years later he transferred to the 7th Cavalry and served for several years in the Dakota Territory at Forts Buford and Meade eventually being assigned to E Troop at Fort Sill the summer before the Pine Ridge Campaign of 1890 – 1891. The following summer Rice was promoted in due course to first lieutenant and transferred to Captain Henry Nowlan’s I Troop. He served with the unit at Fort Riley until May 1895 when the regiment’s headquarters and one squadron were transferred to the Department of Colorado and took up station at Fort Grant, Arizona Territory. Rice commanded a detachment of Indian Scouts and had at least one opportunity to pursue Apache marauders into the Chiricahua Mountains in the spring of 1896 when a sheepherder was murdered in the vicinity of Cave Creek, a rare occurrence in the waning years of the nineteenth century. In the summer of 1896, Lieutenant Rice corresponded with the 7th Cavalry’s former adjutant, Lieutenant J. Franklin Bell, who was serving as aide-de-camp to then Brigadier General James Forsyth. Bell followed his former regimental commander to his new assignment as the commander of the Department of California. The aide was contacting many of his former regiment’s officers in an attempt to further document acts of gallantry and if possible see that those deserving were awarded Medals of Honor. Bell contacted Rice regarding Captain Varnum’s actions at White Clay Creek, seemingly the same action in which Varnum had recommended Rice for recognition five years earlier. In responding to Bell, Rice eluded to his intemperate habits of his second lieutenant years indicating that his days of drinking to excess were behind him. ….Still if there remains any doubt in your mind on the subject Gresham would probably be better able to clear it up than I; he was with Varnum all of the time and as I was a trifle “woozy” in those days it might possibly be that I might make a slight mistake as to detail while he would not be apt to. Lieutenant Rice later provided a letter in the summer of 1897 supporting Lieutenant Gresham’s recommendation that Captain Varnum be awarded for his actions at the Drexel Mission fight. Varnum received the Medal of Honor that fall. Following is Rice’s letter to the Adjutant General’s Office. The Department of Arizona had been absorbed into the Department of Colorado in 1893, and with the military department’s headquarters at Denver, Rice likely had chance to spend time in the mile-high city. It was there that he married Miss Gertrude Olive Gaylord on 16 September 1896. She was fifth of the six children of Edward H. and Sarah M. (Rich) Gaylord. Gertie’s father had settled in Junction City, Kansas, after being mustered out of service at Fort Riley in October 1865. Gertie was born there two years later and spent her childhood on the Kansas prairie. Her family moved to Denver when she was about ten. Both of her parents had passed away in the late 1880s, and the cavalry lieutenant and his bride were married in the home of her sister and brother-in-law, Dr. and Mrs. J. Sol Smith. The newlywed couple returned to the Arizona Territory, and the following year Lieutenant Rice took station at Fort Huachuca with a subsequent appointment as the military Indian agent at the San Carlos reservation. A boarding school opened on the reservation in 1900 and was named in the Lieutenant’s honor; the Rice Elementary School is still open today. Shortly after assuming duties at San Carlos, Gertie gave birth to the Rices’ only child, Susanne, in November 1897. Mother and child returned to Colorado while the cavalry officer served consecutive assignments overseas. The Lieutenant’s assignment at the reservation kept him from any action during the Spanish-American War, but he served in the occupation of Cuba at Columbia Barracks in command of the 7th Cavalry’s L Troop. Rice was appointed a major in the U.S. Volunteers in October 1899 and served with the 48th U.S. Volunteer Infantry in the Philippines where he commanded that regiment’s first battalion. While serving in that capacity Rice was promoted in the regular army to captain in the 3rd Cavalry, and when the Volunteers were disbanded in the summer of 1901, the major reverted to his new regular rank of captain. Service with the 3rd Cavalry saw Rice posted to Fort Assiniboine, Montana, the Presidio at San Francisco, another tour in the Philippines, and on detached service as a professor of military science at the College of St. Thomas in his native city of Saint Paul. He was promoted to major in the 3rd Cavalry in 1911 and assigned to Fort Sam Houston. This assignment saw him commanding a battalion on the U.S.-Mexican border at El Paso in the summer of 1912 where there was skirmishing with Mexican revolutionaries, the beginnings of four years of border conflict that culminated with General Pershing’s Punitive Expedition. 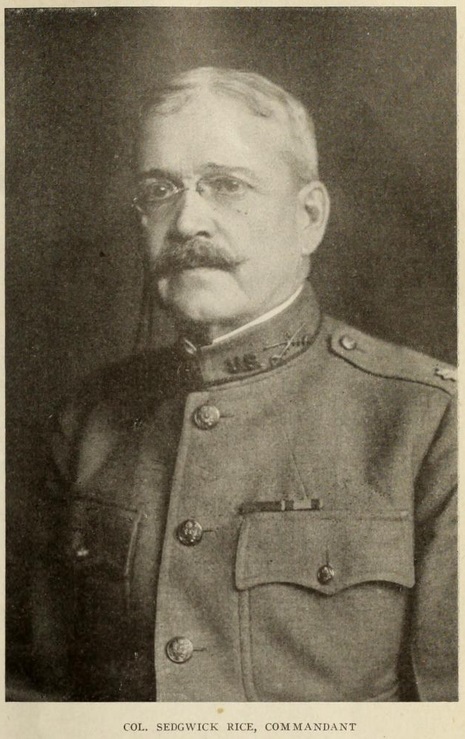 Major Rice served as commandant of the U.S. Disciplinary Barracks at Fort Leavenworth from 1914 to 1919. In December 1914, Major Rice reported to Fort Leavenworth, Kansas, where he assumed command of the U.S. Disciplinary Barracks and the military guard force. During his tenure at Leavenworth, Rice received sequential promotions to lieutenant colonel in June 1916 and to colonel three weeks later. Just as his assignment as an Indian agent kept him out of the Spanish-American War, so to his assignment as superintendent of the Disciplinary Barracks kept him from deploying to Europe during the Great War. He did not, however, go unrecognized during this period of world war. Congress authorized two military decorations in 1918, the Distinguished Service Cross and the Distinguished Service Medal. As the War Department began recognizing American heroes in Europe they also combed military records for soldiers still on active duty who had been recognized in earlier conflicts with an eye to decorate these heroes of an earlier age. A provision in the Congressional Act establishing those two decorations stated, “And in the cases of officers and enlisted men now in the Army who have been mentioned in orders, now a part of official records, for extraordinary heroism or specially meritorious services….” Apparently Colonel Rice’s mention in General Order No. 100 in 1891 was enough to justify the award of a Distinguished Service Medal. The three other officers from that 1891 list of honorable mentions still serving on active duty in the fall of 1918–Peter E. Traub, Guy H. Preston, and Samuel Burkhardt, Jr.–seem to have been overlooked for award of either a Distinguished Service Cross or Medal. Colonel Rice had no easy assignment at Fort Leavenworth. The confinement facility had recently undergone a change from a prison with the purpose of merely detaining criminals until their sentence was fulfilled to a disciplinary barracks with the mission of identifying men who could be reformed and ultimately returned to honorable service. The new commandant worked diligently to make Fort Leavenworth’s prison a model of criminal reformation. His willingness to work with prisoners caught up to him in 1918. The expansion of the military during the war also saw a three fold expansion of the prison population at Fort Leavenworth. Many of the new prisoners were conscientious objectors, some for religious reasons and some for political. The crowded conditions brewed discontent and several riots broke out in the winter of 1918 and 1919 followed by a general prison strike in January. Colonel Rice debated whether to put down the strike by military force, and had at his disposal ample military forces to do so. The commandant who three decades earlier had played a central role in crushing a Sioux outbreak at Wounded Knee and just months earlier had been decorated for his actions during that distant campaign, took a different tact with his prison wards. No one knows better than I what this might mean. It might mean violence and it might mean bloodshed. If these men were merely mutinous, I should not hesitate. But this is no ordinary prison uprising. These men have some justification, much justification, for their feeling of discontent. I know the approved military method of handling this situation; but I know, too, that we are in a changed world to-day. The American people do not stand for the use of military force if there is a better way. I propose to find that better way. I shall listen to a committee of prisoners. If this is surrender, let them make the most of it. The prisoners submitted an organized list of demands and Colonel Rice agreed to present them to Secretary of War Baker, which he did the following week. Apparently with Secretary Baker’s concurrence, Rice met many of the prisoners demands, worked tirelessly to get the sentences of the conscientious objectors commuted or reduced since the war was over, and empowered a hierarchy of prisoners to regulate themselves within the facility. Unbeknownst to the commandant, the strike was organized by several communist objectors, men like Carl Haessler, a Rhode Scholar and former college professor, and H. Austin Simmons, a reporter for the Chicago Examiner. Under the new agreement with Rice, these men established vocational training that was little more than communist indoctrination. Working at the prison newspaper plant, the “Soviet” began publishing an internal communist journal titled Wire City Weekly. When copies of the unsanctioned paper began circulating outside the prison across the communist party in America, the Federal Bureau of Investigation paid a visit to Fort Leavenworth. Rice had recently put down another strike and abolished the privileges granted from the previous strike, but the appearance of communist propaganda published from inside the prison was more than Secretary Baker could tolerate. Colonel Rice was relieved in July 1919 and ordered before a military retirement board the following month. Colonel Rice was widely quoted in the press as having gained approval from Secretary Baker in all the privileges he implemented at the prison. Evidently the retirement board found the fifty-nine-year-old colonel fit for duty. 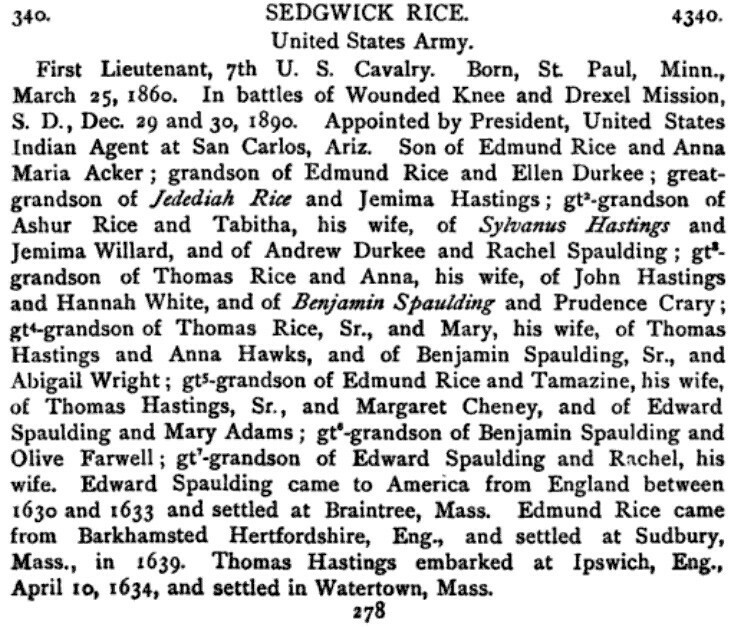 (Click to enlarge) Sedgwick Rice was a member of the Empire State Society of the Sons of the American Revolution. Rice was given command of the 12th Cavalry Regiment and stationed at Fort Brown, Texas, on the Mexican border. Following his retirement by law at the age of sixty-four in March 1924, he and Gertie settled in Brownsville, the community adjacent to Fort Brown. Colonel Rice was hospitalized Christmas Eve that year for throat cancer and died 15 February 1925. He was laid to rest with full military honors at Arlington National Cemetery. Mrs. Gertrude Rice moved to Washington D. C. and survived her husband by fourteen years. She passed away on 23 March 1938 at her daughter’s home in Hagerstown, Maryland. Susanne Rice had married John W. Byron, a third-generation West Point graduate, in 1917. At the time of Colonel Rice’s death in 1924 he had three grandchildren from his daughter and son-in-law: Jane, Susanne, and Joseph. A fourth grandchild, Sedgwick Rice Byron, was born in 1929. Colonel Sedgwick Rice was a member of the Sons of the American Revolution. 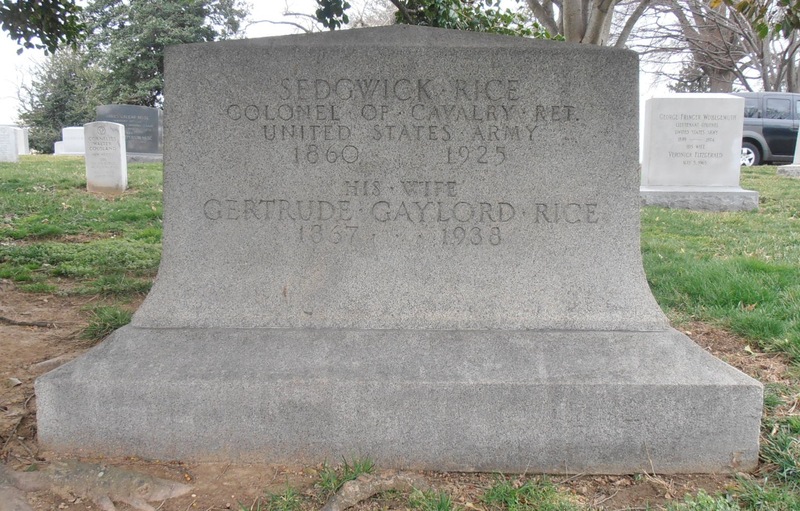 Colonel Sedgwick Rice and Mrs. Gertrude Gaylord Rice are buried in Arlington National Cemetery. National Archives and Records Administration (NARA); Washington, D.C., Returns from U.S. Military Posts, 1800-1916, Microfilm Serial: M617, Microfilm Roll: 1175, Military Place: Fort Lyon, Colorado Territory, Return Period: Nov 1883; Military Place: Fort Sill, Indian Territory, Return Period: Sep 1890; Military Place: Fort Buford, Dakota Territory, Return Period: Jul 1886. Adjutant General’s Officer, “7th Cavalry, Troop E, Jan. 1885 – Dec. 1897,” Muster Rolls of Regular Army Organizations, 1784 – Oct. 31, 1912, Record Group 94, (Washington: National Archives Record Administration); Samuel L. Russell, “Selfless Service: The Cavalry Career of Brigadier General Samuel M. Whitside from 1858 to 1902,” Masters Thesis, (Fort Leavenworth: U.S. Army Command and General Staff College, 2002), 139 and 141. 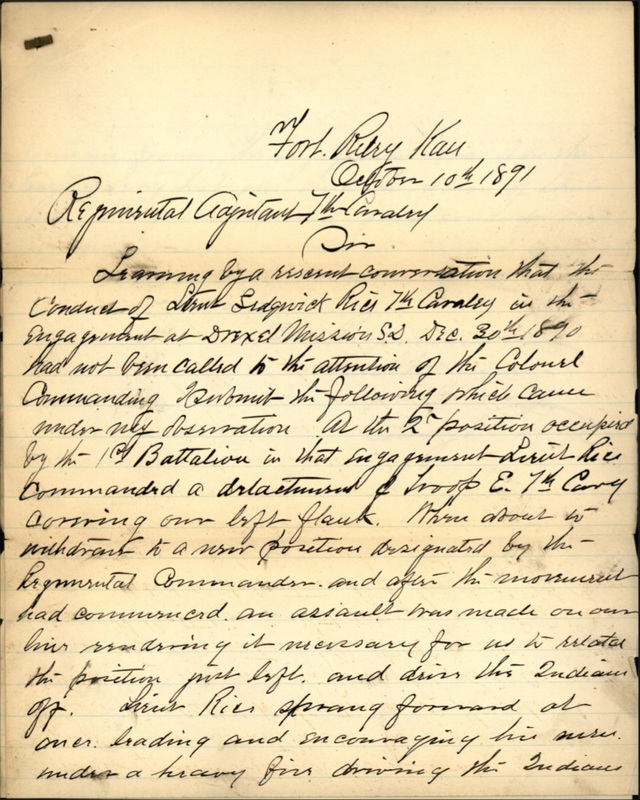 Jacob F. Kent and Frank D. Baldwin, “Report of Investigation into the Battle at Wounded Knee Creek, South Dakota, Fought December 29th 1890,” in Reports and Correspondence Related to the Army Investigations of the Battle at Wounded Knee and to the Sioux Campaign of 1890–1891, the National Archives Microfilm Publications (Washington: The National Archives and Records Service, General Services Administration, 1975), Roll 1, Target 3, Jan. 1891, 679-681. Adjutant General’s Office, Case of Honorable Mention for Sedgwick Rice, Principal Record Division, file 3466, Record Group: 94, Stack area: 8W3, Row: 7, Compartment 30, Shelf: 2. Research conducted by Vonnie S. Zullo of The Horse Soldier Research Service. Ancestry.com, Texas, Death Certificates, 1903–1982 [database on-line], Provo, UT, USA: Ancestry.com Operations, Inc., 2013; National Archives, “Indexes to the Carded Records of Soldiers Who Served in Volunteer Organizations During the Mexican War, compiled 1899 – 1927, documenting the period 1846 – 1848,” Publication: M616, National Archives Catalog ID: 654518, Roll: 0031; Le Roy Barnett and Roger Rosentreter, Michigan’s Early Military Forces (Detroit: Western State University Press, 2003), 338; Saint Paul Daily Globe, “Saint Paul’s Seventeen Mayors” (Saint Paul, Minn., 12 May 1895), 26-27. Ancestry.com, U.S. City Directories, 1821-1989 [database on-line], Publication Title: St Paul, Minnesota, City Directory, 1881, Image: 370, Page: 630; Adjutant General’s Office, Official Army Register, January 1, 1920 (Washington: Government Printing Office, 1920), 167; National Archives and Records Administration (NARA), Washington, D.C., Returns from U.S. Military Posts, 1800-1916, Microfilm Serial: M617, Microfilm Roll: 661, Military Place: Fort Lyon, Colorado Territory, Return Period: Nov 1883; Military Place: Fort Reno, Indian Territory, Return Period: May 1885; Military Place: Fort Buford, Dakota Terrotory, Return Period: Jul 1886; Military Place: Fort Meade, Dakota Territory, Return Period: Sep 1887; Military Place: Fort Sill, Indian Territory, Return Period: Dec 1888 and Aug 1890. Adjutant General’s Office, “General Order No. 100, Headquarters of the Army, December 17, 1891,” General Orders and Circulars – 1891, (Washington: Government Printing Office, 1892), 2-9. Returns from U.S. Military Posts, 1800-1916, Military Place: Fort Grant, Arizona Territory, Return Period: Jun 1895; Cornelius C. Smith, Jr., Fort Huachuca, The story of a frontier post (Washington: Government Printing Office, 1976), 149. Kansas City Daily Journal (Kansas City, Mo. : 20 Sep 1896), 6. Returns from U.S. Military Posts, 1800-1916, Military Place: Fort Huachuca, Arizona Territory, Return Period: Nov 1897; Paul R. Nickens and, Kathleen Nickens, Old San Carlos (Chicago: Arcadia Publishing, 2008), 114; Apache Moccasin, “San Carlos Unified School District announces Open House,” Arizona Silve Belt (http://www.silverbelt.com/v2_news_articles.php?story_id=3844&page=77) posted 27 Jun 2012, accessed 25 Jan 2015. United States Federal Census, Year: 1900; Census Place: Sheridan, Arapahoe, Colorado; Roll: 121; Page: B; Enumeration District: 0223; FHL microfilm: 1240121. Adjutant General’s Office, 1920 Army Register, 167. 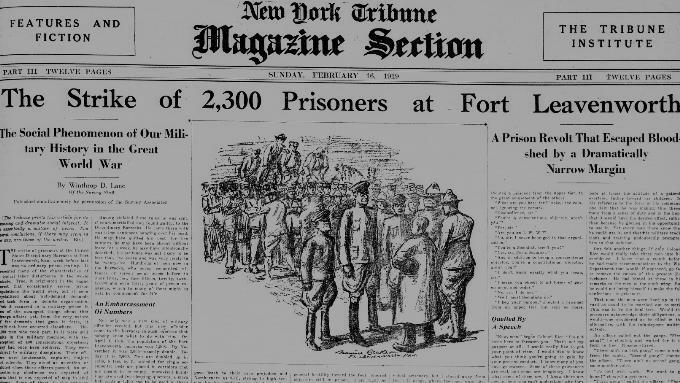 Returns from U.S. Military Posts, 1800-1916, Military Place: Fort Sam Houston, Texas, Return Period: Jun 1912; Associated Press, “Mexican Outlook Worries President,” New York Times (New York: 8 Sep 1912), 1; Associated Press, “Officer Fears Rebel Trouble at Palomas,” El Paso Herald (El Paso: 14 Aug 1912), 1. Winthrop D. Lane, “Fort Leavenworth: The Interplay of Military and Penal Discipline in the Regeneration of Men,” The Survey, vol. 42, no. 14 (New York, 5 Jul 1919), 535. Returns from U.S. Military Posts, 1800-1916, Military Place: Fort Leavenworth, Kansas, Return Period: Dec 1914; U.S. Congress, “Distinguished Service Cross Medal, Report No. 341,” House of Representatives, 67th Congress, 1st Session, vol. 2 (Washington: Government Printing Office, 1921), 1-3. Winthrop D. Lane, “The Strike at Fort Leavenworth,” The Survey, vol. , no. (New York, 5 Jul 1919), 687-693. Ibid. Erwin Marquit, Memoirs of a Lifelong Communist, 7 (http://www.tc.umn.edu/~marqu002/memoirs.html) accessed 25 Jan 2015. Edward H. Hall, ed., Register of the Empire State Society of the Sons of the American Revolution (Sons of the American Revolution. Empire State Society, 1899), 278. The Morning Herald Newspaper (Hagerstown, Md. : 24 Feb 1925), 16; The Daily Mail (Hagerstown, Md. : 24 Mar 1938), 16. Paul Hays, photo., “Col Sedgwick Rice,” FindAGrave (http://www.findagrave.com/cgi-bin/fg.cgi?page=pv&GRid=49358675&PIpi=76764893) posted 17 Mar 2013, accessed 25 Jan 2015. 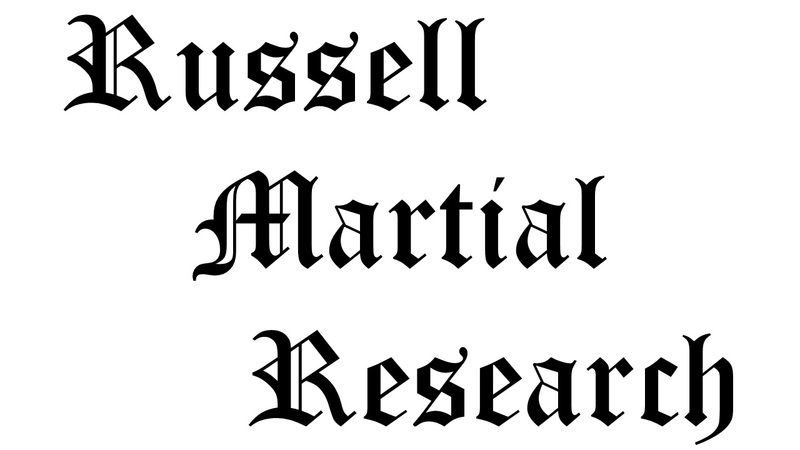 Citation for this article: Samuel L. Russell “Second Lieutenant Sedgwick Rice, E Troop, 7th Cavalry,” Army at Wounded Knee (Sumter, SC: Russell Martial Research, 2013-2015, http://wp.me/p3NoJy-Fb), updated 5 Oct 2015, accessed date _________. This entry was posted in Award Recipients, Officers, Wounded Knee Investigation and tagged 1890, 7th Cavalry, 7th Cavalry Regiment (United States), Battle of Wounded Knee, Big Foot, Cavalry, Cavalry Troop, Drexel Mission, Fort Leavenworth, Fort Riley, Pine Ridge, Pine Ridge Agency, Pine Ridge Indian Reservation, Sioux, Wounded Knee, Wounded Knee Creek, Wounded Knee Massacre. Bookmark the permalink.